This book shares authors vision to build one million students as global leaders and his personal vision statement to shape students as global citizens to achieve international peace, prosperity, stability and security. It highlights on career, personality development, leadership and CEO success. It Enhances your employ ability skills. Outlines tools and techniques to fast-track your career. Underscores the importance of leadership pipeline for women leaders. Implores you to sell yourself to stand out. Elevates you as a global leader and citizen. 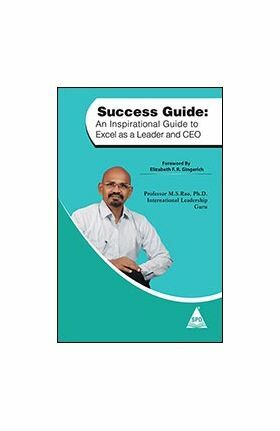 The book implores you to acquire inspirational acumen; CEO acumen; workplace acumen and leadership acumen. It is useful for HR people and serves as a quick reference pocket guide for students, learners and leaders to scale the corporate ladder quickly. It is also useful for educators, entrepreneurs, mentors, coaches, trainers, learners, leaders and CEOs. Professor M.S.Rao is an international leadership guru who rose from humble origins. He is recognized as one of the worlds leading leadership educators, authors, speakers, coaches, consultants and practitioners. He has 33 years of experience in leadership development, and conducts leadership development training programs for various corporates and educational institutions. He is an Executive Coach and Motivational Speaker. He coined a new leadership learning tool  Soft Leadership Grid; leadership training tool  11E Leadership Grid; and innovative teaching tool  Mekas Method. His areas of interest include Executive Coaching, Executive Education and Leadership.